The United States withdrew from U.N. Human Rights Council after slamming Russia, China, Cuba and Egypt for thwarting U.S. efforts to reform the Council. VietPress USA (June 19, 2018): Today om Tuesday, June 19, 2018, the United States withdrew from the United Nations Human Rights Council over what it called chronic bias against Israel and a lack of reform, a move activists warned would make advancing human rights globally even more difficult. Human Rights Watch executive director Ken Roth said: "The U.N. Human Rights Council has played an important role in such countries as North Korea, Syria, Myanmar and South Sudan, but all Trump seems to care about is defending Israel". Washington's withdrawal is the latest U.S. rejection of multilateral engagement after it pulled out of the Paris climate agreement and the 2015 Iran nuclear deal. It also comes as the United States faces intense criticism for detaining children separated from their immigrant parents at the U.S.-Mexico border. U.N. human rights chief Zeid Ra'ad al-Hussein on Monday called on Washington to halt its "unconscionable" policy. WASHINGTON/UNITED NATIONS (Reuters) - The United States withdrew from a "hypocritical and self-serving" United Nations Human Rights Council on Tuesday over what it called chronic bias against Israel and a lack of reform, a move activists warned would make advancing human rights globally even more difficult. Standing with U.S. Secretary of State Mike Pompeo at the State Department, U.S. Ambassador to the United Nations Nikki Haley slammed Russia, China, Cuba and Egypt for thwarting U.S. efforts to reform the council. She also criticized countries which shared U.S. values and encouraged Washington to remain, but "were unwilling to seriously challenge the status quo." "Look at the council membership, and you see an appalling disrespect for the most basic rights," said Haley, citing Venezuela, China, Cuba and Democratic Republic of Congo. She did not mention Saudi Arabia, which rights groups pushed to be suspended in 2016 over killings of civilians in the Yemen war. Among reforms the United States had pushed for was to make it easier to kick out member states with egregious rights records. Currently a two-thirds majority vote by the 193-member U.N. General Assembly is needed to suspend a member state. Haley also said the "disproportionate focus and unending hostility toward Israel is clear proof that the council is motivated by political bias, not by human rights." Israeli Prime Minister Benjamin Netanyahu welcomed the U.S. decision. The United States has long shielded its ally Israel at the United Nations. In citing what it says is bias against Israel, the administration of President Donald Trump could further fuel Palestinian arguments that Washington cannot be a neutral mediator as it prepares to roll out a Middle East peace plan. Washington also relocated its embassy to Jerusalem after recognizing it as the capital of Israel, reversing decades of U.S. policy. The United States is half-way through a three-year term on the 47-member Geneva-based body and the Trump administration had long threatened to quit if it was not overhauled. Rights groups have criticized the Trump administration for not making human rights a priority in its foreign policy. Critics say this sends a message that the administration turns a blind eye to human rights abuses in some parts of the world. "Given the state of human rights in today's world, the U.S. should be stepping up, not stepping back," Zeid said after Haley announced the U.S. withdrawal. Reuters reported last week that talks on reforming the council had failed to meet Washington's demands, suggesting the Trump administration would quit. 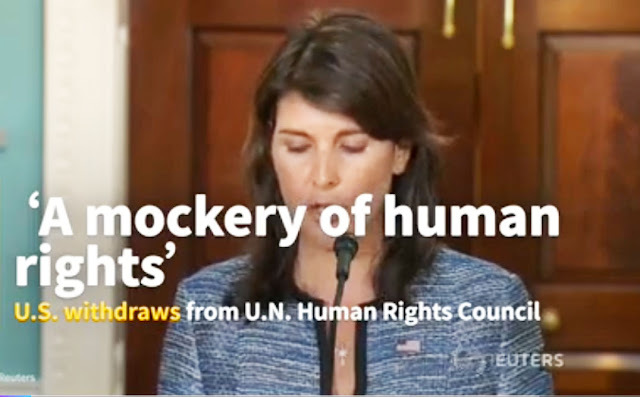 "The Human Rights Council enables abuses by absolving wrongdoers through silence and falsely condemning those that committed no offense," Pompeo said. Diplomats have said the U.S. withdrawal could bolster countries such as Cuba, Russia, Egypt and Pakistan, which resist what they see as U.N. interference in sovereign issues. Haley said the withdrawal "is not a retreat from our human rights commitments." Twelve rights and aid groups, including Human Rights First, Save the Children and CARE, warned Pompeo the U.S. withdrawal would "make it more difficult to advance human rights priorities and aid victims of abuse around the world." Jamil Dakwar, director of the American Civil Liberties Union's Human Rights Program, said Trump's "misguided policy of isolationism only harms American interests." The EU said Washington's decision "risks undermining the role of the U.S. as a champion and supporter of democracy on the world stage." British Foreign Secretary Boris Johnson said it was regrettable and that the council was the "best tool the international community has to address impunity." The Human Rights Council meets three times a year to examine human rights violations worldwide. It has mandated independent investigators to look at situations including Syria, North Korea, Myanmar and South Sudan. Its resolutions are not legally binding but carry moral authority. When the Council was created in 2006, U.S. President George W. Bush's administration shunned the body. Under President Barack Obama the United States was elected for a maximum two consecutive terms on the council by the U.N. General Assembly. After a year off, Washington was re-elected in 2016 for its current third term. U.N. officials said the United States would be the first member to withdraw from the council. Haley said a year ago that Washington was reviewing its membership. The body has a permanent standing agenda item on suspected violations committed by Israel in the occupied Palestinian territories that Washington wanted removed. The council last month voted to probe killings in Gaza and accused Israel of using excessive force. The United States and Australia cast the only "no" votes. "The U.N. Human Rights Council has played an important role in such countries as North Korea, Syria, Myanmar and South Sudan, but all Trump seems to care about is defending Israel," said Human Rights Watch executive director Ken Roth.